Whenever we create a new asp.net application or html application on that case look and feel is one of the most important parts. 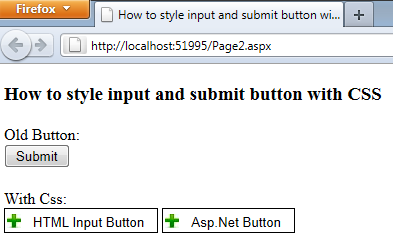 So in this article I will show you how you can convert the asp.net button control or html input r submit button into a stylish button control just by applying CSS/CSS3. Some of my previous article of asp.net are as follows: Passing Value From One Form to Another in Asp.net Using C#.Net, Free jQuery Spell Checker Plugins For Asp.Net, Reset Div Height by Using jQuery. Some of my windows application articles are follows: Displaying More than One Month in the Windows Forms MonthCalendar Control Using C#.Net, Email Validation in Windows Application C#.Net and VB.Net | Validating Email ID in TextBox in C# .Net,. For applying style sheet we just needed to add the style name with class attribute of button or input control. Now view the page in browser.